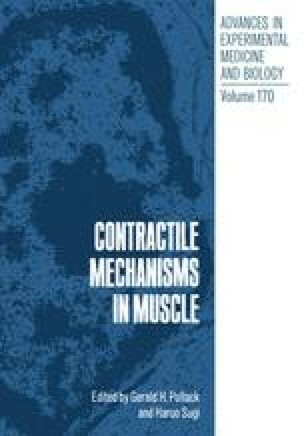 Muscle Cross-Bridges: Do They Rotate? We have used electron paramagnetic resonance (EPR) spectroscopy to monitor the orientation of spin labels attached specifically to a reactive sulfhydryl on the myosin heads in glycerinated rabbit psoas skeletal muscle. Previous work has shown that the paramagnetic probes are highly ordered in rigor muscle and display a random angular distribution in relaxed muscle (Thomas and Cooke, 1980). Addition of ADP to rigor fibers caused no spectral changes, while addition of AMPPNP or PPi increased the fraction of disordered probes. We show here that the application of stress to fibers in the presence of ADP, AMPPNP or PH causes no change in their spectra. During the generation of isometric tension approximately 80% of the probes display a random angular distribution as in relaxed muscle while the remaining 20% are highly oriented at the same angle as found in rigor muscle. In each of the above cases the spectrum consists of two components, one highly ordered as in rigor and one highly disordered. Saturation transfer EPR has shown that the ordered component is rigid while the disordered component is mobile on the microsecond time scale (Thomas, Ishiwata, Seidel and Gergely, 1980). These data lead to the conclusion that the disordered spectral component arises from myosin heads that are detached from actin while the ordered component comes from heads that are attached to actin. The observation that the ordered component displays an identical angular distribution under all conditions indicates that its orientation is not linked to force generation.